Trust in me my friend, for I am your comrade. and search out those who wish to do harm to others. and the caring touch of your hands. Know that each day by your side is my reward. My days are measured by the coming and going of your footsteps. The voice of authority when I have done wrong. I will remain ever silent, ever vigilant, ever loyal. 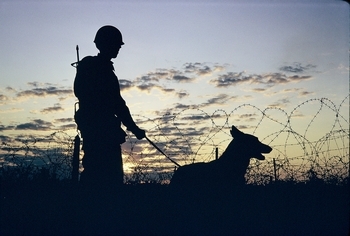 I am a Military Working Dog. We are the guardians of the night. your loyal companion until the end.